Big Wave Sushi Lake Orion review – pics, and menu info. 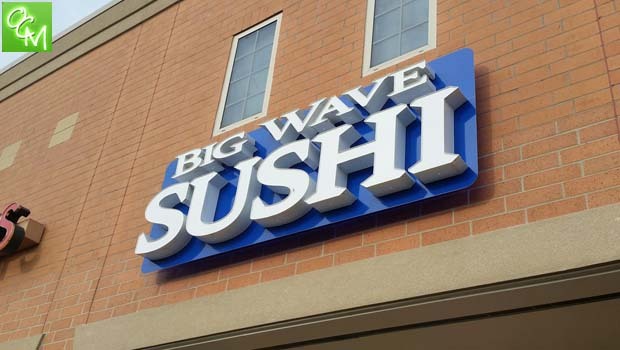 Big Wave Sushi is located in a strip mall on Baldwin Rd south of Maybee Rd in Lake Orion MI. I was going to be in the area one day so I phoned in an order as part of my recent Sushi tour. The staff was very helpful on the phone. There was no language barrier since everyone who works there is not Asian… much different than all the other sushi restaurants I’ve reviewed which have been Asian-owned. Anyway, when I got to the restaurant, I went straight to the counter. I could see the back of a head sticking up from behind the counter and realized that the person who was supposed to greet me was sitting on the floor with her back leaning against the register wall. Someone finally notified her that I was standing there waiting and she got up to help. I had ordered three rolls. I had to ask for descriptions of what came on the rolls because the menu unfortunately did not list the ingredients for all the rolls. Because I have food sensitivities, and other likes and dislikes, I prefer to know exactly what goes into each roll. As I picked up the rolls, I asked the girl behind the counter which was which and she didn’t know. The sushi rolls themselves were fresh and decent, but small. When I picked up the order, all three rolls fit into a small plastic take out container. I’m glad I ordered three rolls because I was sharing them with a friend and my son. If I were to go back, I’d definitely order more knowing now how small they are. They’re probably the smallest I’ve seen yet. Additionally, I am one that prefers the Nori wrap to be on the inside and the rice on the outside. Just a preference. All the rolls I ordered had the Nori on the outside which gives it a whole different texture for me. I ordered the Spider Roll, Spicy Salmon and Spicy Shrimp. Big Wave Sushi Lake Orion has about six or so tables inside for seating, in addition to a Sushi bar. They also had live music playing when I went on a Friday evening. It’s not a traditional sushi/Japanese style.